Stone & Chalk, the Sydney-based fintech hub, is about to rack up its biggest investment for a client – $20 million for a ‘series B’ raising – coinciding with its move into new premises that now mark the country’s major centre for innovation in the financial services industry. Stone & Chalk has moved into 11 York Street, which also houses the News Corp-backed Fishburners, and the smaller TankStream Labs and the creative specialist ‘The Studio’. The new office is near Barangaroo, which is also trying to be a creative hub for financial services, notwithstanding the tenants including such straighty-180 types as Westpac and Mercer. Take a stroll around. There are lots of 60-something gents trying to grow ponytails and fit into too-tight jeans. Anyway, this is not to take anything away from Stone & Chalk’s successes in the past couple of years. Craig Dunn, the Stone & Chalk chair and former AMP chief executive, opened the new office last Friday night, with his chief executive, Alex Scandurra, to a packed audience of about 250 investees and investors. Interestingly, Dunn last year took up riding a motorcycle. Scandurra wore battery-operated lights around his neck at the Friday night presentation as he spoke of the achievements of the last two years. His business card says he is the “chief hustler”. Stone & Chalk is a bit like that. The hub had to move from the old 50 Bridge Street AMP premises because of a redevelopment at that site. Scandurra, neck lights and all, announced that since its establishment in 2015 more than 200 Stone & Chalk companies, including alumni, had raised about $230 million. The biggest ‘series A’ raising was $12.5 million. The undisclosed ‘series B raising’ record of $20 million would be announced soon. The largest IPO – Flamingo – was worth $50 million, Scandurra said, neck lights still flashing. 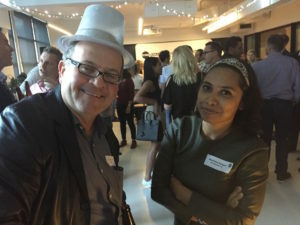 One of the start-ups, Ambassador MC, was represented by co-founder Shamima Sultana, and sponsor Link Group by Trevor Dixon, head of that company’s international office. This is what the hub is all about, according to Scandurra. It’s investors talking with investees, and investees talking with other investees and investors talking with other investors. It’s about talking. Flashing neck lights and motorbikes are a bonus.